Descant permitted with a license from CCLI.com or from OneLicense.net. If you do not own one of these licenses, please contact the copyright holder for permission. 1 O come, all ye faithful, joyful and triumphant! Come and worship, come and worship Christ, the newborn King! He came as a baby in a manger. He came in a lowly stable. O come, let us adore him, Christ, the Lord! Amen. Inspired by the Nicene Creed’s confession about the incarnation of Christ, John F. Wade’s text is one of our finest Christmas hymns, happily devoid of the folksy sentimentality that too often surrounds Jesus’ birth. In this well-known and loved Christmas hymn, we are invited as God's faithful people to go to Bethlehem and adore Christ the Lord (st. 1). We sing words borrowed from the Nicene Creed to express the Christian faith about the incarnation (st. 2). Then after exhorting the angels to sing their praise (st. 3), we greet Christ on his birthday (st. 4). The text has two unusual features for such a popular hymn: it is unrhymed and has an irregular meter. Some scholars have suggested that Wade fashioned ADESTE FIDELES from melodic fragments of stage music. In the original Wade manuscripts the tune was in triple meter. It was changed to its present form by 1782 and published in the elder Samuel Webbe's Essay on the Church Plain Chant. Some Protestant hymnals have published ADESTE FIDELES as a setting for other texts; for example, Ira D. Sankey used this tune for "How Firm a Foundation." 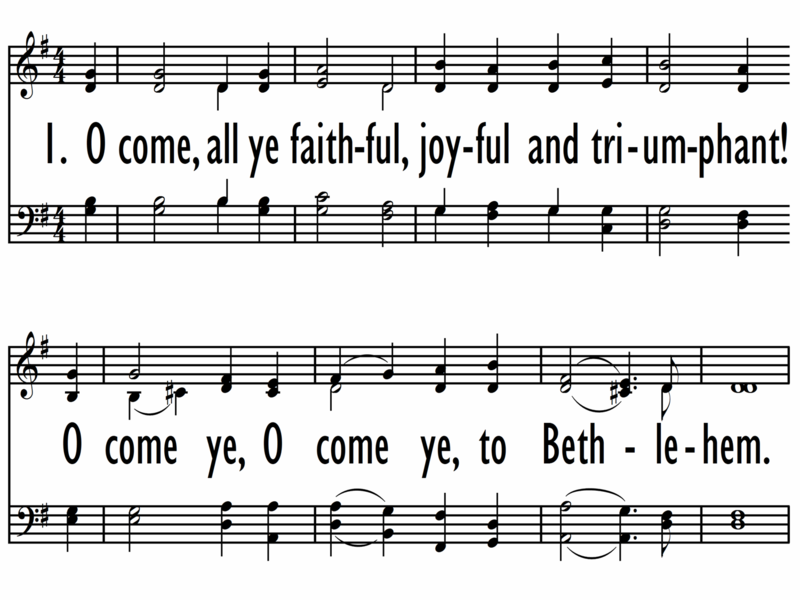 But the tune and text are now commonly used together, and "O Come, All Ye Faithful" remains one of the most-loved Christmas hymns. The tune is a fuguing tune; it begins chordally and uses some imitation in the refrain. 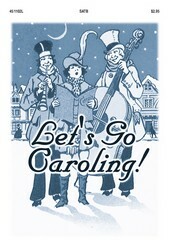 The harmonization is from The English Hymnal (1906); the descant is from Hymns Ancient and Modern (revised ed., 1947). Sing the stanzas in unison and the refrain in parts. The translation in Lift Up Your Hearts is based primarily on the work of Frederick Oakeley (b. Shrewsbury, Worcester, England, 1802; d. Islington, London, England, 1880), who translated the text for use at the Margaret Street Chapel (now All Saints', Margaret Street) in London (1841). It is also based on translations found in both F. H. Murray's A Hymnal for Use in the English Church (1852) and William Mercer's Church Psalter and Hymn Book (1854). Educated at Christ Church, Oxford, England, Oakeley was ordained in the Church of England in 1826. He served at Balliol College, Lichfield Cathedral, Whitehall, and Margaret Street Chapel in London. Influenced by the Oxford Movement, Oakeley and Richard Redhead, the organist of Margaret Chapel, instituted "high" liturgies there, eliciting the charge of "Romanism." Oakeley also asserted in a pamphlet that; even though he would not "teach," he certainly should be allowed to "hold" all Roman Catholic doctrines. These views caused him to be suspended from his office. Rather than retract his statement, he joined the Roman Catholic Church in 1845 and associated himself with John Henry Newman. Following his reordination in the Roman Catholic Church, Oakeley worked among the poor in the Westminster area of London. In his writings he defended the Roman theology and practices of worship. He also wrote four volumes of verse as well as Historical Notes on the Tractarian Movement (1865). John Francis Wade (b. England, c. 1711; d. Douay, France, 1786) is now generally recognized as both author and composer of this hymn, originally written in Latin in four stanzas. The earliest manuscript signed by Wade is dated about 1743. By the early nineteenth century, however, four additional stanzas had been added by other writers. A Roman Catholic, Wade apparently moved to France because of discrimination against Roman Catholics in eighteenth-century England—especially so after the Jacobite Rebellion of 1745. He taught music at an English college in Douay and hand copied and sold chant music for use in the chapels of wealthy families. Wade's copied manuscripts were published as Cantus Diversi pro Dominicis et Festis per annum (1751). There is a sense of urgency to this hymn. Imagine a child, tugging at your hand, saying insistently, “Let’s go, let’s go, let’s go!” In the same way, imagine someone pulling at your sleeve or grasping you by the hand, half dragging you as they run through the crowd, saying over and over again, “Come!” We are told that patience is a virtue, but in this case, impatience is a beautiful thing. For who could stand by and wait when all we want to do is worship our Lord and Savior? Albert Bailey writes, “The poet takes us by the hand and leads us with triumphant song to the cave of the Nativity in Bethlehem, shows us the Babe, and bids us adore” (The Gospel in Hymns, 279). This hymn invites us to sing with the angels, sing with our families, sing with our fellow believers, and with every fiber of our being, worship Christ the Lord.